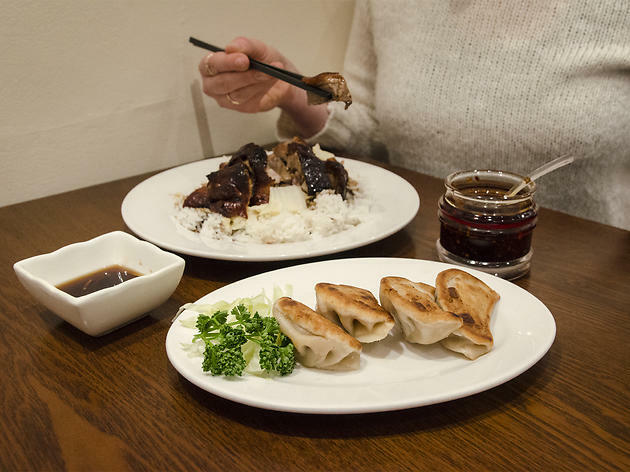 Huge flavours from a huge Chinese menu, with small prices and an even smaller kitchen – it’s all a-okay at TPT. The menu in the window of Café TPT looks longer than the complete musings of Confucius. It’s not unusual to see a big menu in Chinatown, but such a vast repertoire seems impossible from a kitchen galley the size of an origami junk. Not so, because dishes from Hong Kong, mainland China and the diaspora are all produced competently, and some of them with commendable aplomb. The Cantonese dishes tend to be better than the Malaysian ones: roast duck on rice was succulent, and a generous helping. A sizzling dish of stuffed tofu, served in a hot stone bowl, was a highlight. Seafood is also a strength, with around 50 dishes to choose from; our squid, part of a noodle dish, was fresh and pert. Many customers were moved to speechlessness by their bubble teas – this is a good place to try these Taiwan-style drinks. TPT isn’t the cheapest of the budget Chinatown cafés, but both cooking and service are better than you might expect. Cafe TPT specialises in all the good dai pai dong (大排檔/ big licence stall) or street food classics and I’ve had pretty decent cheap and cheerful late night Chinese here before. It’s definitely one of those charming establishments that aren’t all that much to look at from the outside and has the super-efficient gruff service - especially at busy times. We’ve had Hainanese chicken rice and congee and stir-fried noodles; which were all fairly good. But unfortunately this time around (it was midweek, late in the afternoon) the experience wasn’t so good - our Singapore noodles lacked ingredients, wok flavour and were a little soggy; and our century egg pork congee (皮蛋瘦肉粥) also lacked ingredients and flavour; however the consistency was good. A little disappointing to be honest, given the dishes we ordered are pretty staple and standard dai pai dong classics; however, we all have our bad days and I’m willing to give this place another chance and overlook this experience. I did see that on the menu on the walls they were branching out to more Sichuan dishes and thus may have had a change in chef recently. Good For: cheap and cheerful, quick meal, large groups, late-night meal, casual lunch/ dinner. DO NOT eat here. It is FILTHY and the food was inedible... dubious meat ugh!!! Complained and they insisted we pay. This place is a health hazard. Can't seem to make it NO stars. It's simple, no frills. But it's always as good as the last visit. If it's late, you're in soho, been drinking all night and needed a hearty fix before you head home - TPT is your last stop of the night! Don't go here if you are expecting a nice decorated restaurant or friendly staff because you'll get the opposite but do expect really good food. Not the place to go for a quiet chat. It's a bit of a tight squeeze and it gets a tad noisy as there's nowhere for the sound to go. Perfect for pre-theatre, though. Service is swift and the staff charming and helpful. As for the food - wonderful!! We decided to bypass the set menu and went a la carte, two mains plus veg and egg-fried rice, all to share. The best sweet and sour fish I've ever tasted and the sizzling beef was excellent, too. Highly recommended. Will definitely be back. Really impressed by the impromptu choice of sudden Chinese dining. My friends and I recently stumbled across this place following our cravings for authentic Chinese food. Located on Wardour Street in the midst of the hustle and bustle of Chinatown, the staff were really courteous and attentive. We went for a set menu option - and had endless amounts of food. We started with a crab and sweetcorn soup and some additional prawn crackers on the side. We then got aromatic crispy duck with pancakes. Mains were all amazing: tofu, chicken, beef, prawns, pak choi and lots of egg-fried rice. We were so full we couldn't move and the prices were really reasonable for all of the food. It was a clean and hygienic environment and we would definitely all return! Amazing! A huge menu, a very kind and willing-to-help staff, gorgeous food! My first visit to China Town would have been slightly overwhelming had a Chinese friend not given me clear instructions to head straight to Cafe TPT without getting sidetracked or wooed by the multitude of places close by. She did me proud, I ate until my waistband got tight and luckily my bank balance didn't take a massive hit as a result. 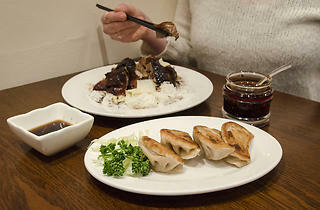 The dumplings and roast BBQ pork are particularly delicious. I have been several times and the service and ambience changes depending on the time of day and the day of the week. If you don't expect top service but want to eat dumplings a plenty this is the place to go. Pretty legit Cantonese food! I went there at 2am when everything was shut, we wanted more booze and food. Disclaimer: I am only rating this based on what I remember after consuming a ridiculous amount of beers. Everything tasted authentic like you would for a casual Cantonese eatery. I think this was the place that served beer in a teapot after 2am. As someone with an asian heritage/being brought up in Malaysia (which has some of the best varieties of asian food) my standards are pretty high. One of my go-to places for a hit of home is Cafe TPT! For me, true asian food needs to not be too expensive, should be freshly made and needs to have the same flavours of home (and not be watered-down or catered to western tastes). Whilst there are still some of those items on the menu ... hello sweet and sour chicken. There are also some real GEMS on the menu. The roasted meats (including the BBQ pork and roast duck) is totally worth ordering. Try the sizzling hot pot! I'd recommend the tofu with prawns or eggplant and pork. Most of the staff at TPT are actually from either Singapore or Malaysia - so those missing the cuisine from there can be sure to ask for their fave dishes (not on the menu!). If you have any space left, branch out and try the frozen beancurd and mango. It'll surprise you how delicious it is! The service is hit and miss... although if you go there enough they do warm to you and your loyalty is rewarded. This is one of my go-to Chinese places in London having been recommended by a Chinese friend. The food is good and pretty authentic. The prices are quite cheap and the service is decent. The restaurant is in the heart of Soho and open until very late so a good spot after a night out in town. Besides the wide variety of menu choices and GREAT food, the customer service here is excellent. From the outside, it looks like nothing, but you cannot beat the value for money, the quality of food or the customer service given. It was the best Chinese food I think I've ever had. One of the chinese restaurants in Soho you can get in and you'll be not disturbed. Little, small but good. Follow the chief recommendations and you will have a good meal. The only place I come to in london for my Chinese. I love the atmosphere, staff and the food. I could not recommend Cafe TPT enough it has the most authentic and fresh Chinese food around!! Personal favourite is the hofun in xo sauce with roast duck. My favourite Chinese in town. Cheap, quick and delicious! What else do you want?